Nodding Chocolate Flower. An unusual hardy perennial from very high elevations in South Africa. A spreading- trailing evergreen plant to 1′ x 1′ in a season. 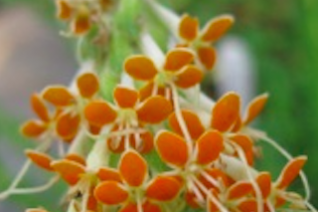 In summer above the rubbery stacked foliage dense groups of bud open to nodding orange flowers. The back of the slightly tubular flowers is pale cream- a nice dual color effect. Up close it pumps out the fine fragrance of chocolate. Blooms for about one month. Full sun and rich to average, well drained soil with regular summer water. Works well in containers and you have a better capacity to enjoy the flower fragrance. Easy to grow little perennial of great grace and it will often self sow when happy. Easy to grow.